Of course – and those of you who have read other posts will realise there’s a pattern emerging here – Sicilians have a different name for it, and not only a different name for it, but a name that everyone else uses to indicate something different. In this case, similar, but nevertheless distinctly different. 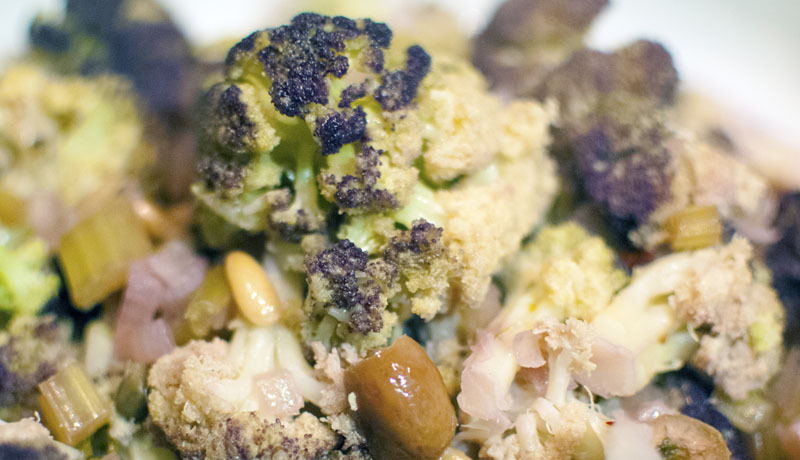 Because they often call cauliflower broccolo. So if a Sicilian says he’s cooking pasta con i broccoli, you might get pasta with broccoli, or you might get pasta with cauliflower. Which in itself may not seem like a big deal, except for the fact that the two recipes have hugely different ingredients, apart from the leading veg itself. This of course begs the question, what do they call broccoli? Well, broccoletti (wouldn’t want to confuse anybody, would we…?). Of course the easiest way round the whole problem is just to go to the market and point – “I want that one”. Which is of course what I did with today’s marvellous specimen. Can you imagine food any more purple (any purpler?) than this? OK, so there’s radicchio, and aubergine, but neither of them have quite the same Simpsons colour palette appeal, the same essential purpleness as this. And it’s not just pretty, either. The purple cauli (and the green romanesco ones, too) are at the same time much milder than the white variety while also tasting better. And the best way to dispatch them, according to my vegetable pusher Letizia, is to do them in a ghiotta bianca, a base often used for stockfish here in Sicily (of which, more in later posts). You could also add a tablespoon of raisins to the soffritto (the onions, garlic, celery etc. sweated in olive oil, which is the base of so much Italian cooking) if you wanted to be very Palermitan. You could of course use any kind of cauliflower here if you can’t find the purple ones. 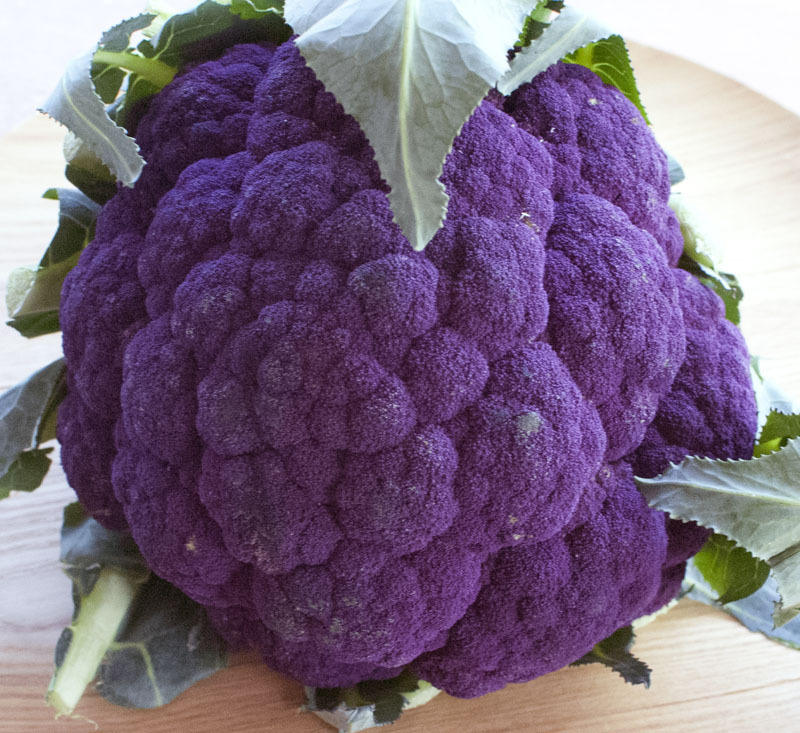 It would be a shame to miss out just because the colour of your cauli’s wrong. Get the soffritto going. 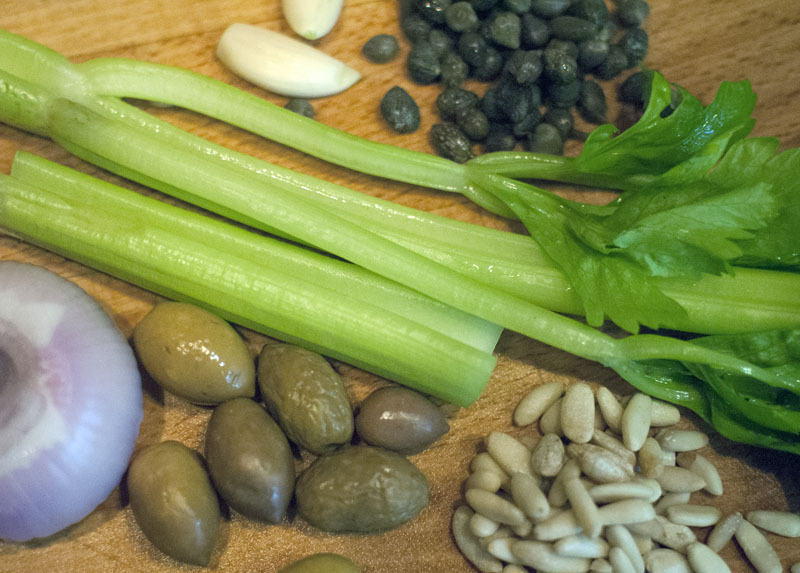 Gently sweat the onion, garlic, capers, pine nuts, celery, olives, anchovies (and chilli if using) in two tablespoons of the oil for ten minutes. Make sure your pan is large enough to take the cauliflower too. In the meantime, cut the cauliflower up into florets, and cut a cross into the base of the thicker stalks. Add the cauliflower to the soffritto and mix well. Add the wine and water and season with salt and pepper. Another good stir to make sure the cauliflower is well coated in the soffritto ingredients. Cook, covered, for five minutes over a medium heat, then check to see how the cauliflower is getting on. You’re aiming for cooked, although still al dente. If it’s not quite there, give it another couple of minutes. The evaporation of the wine and water should coincide more or less with the cauliflower being ready. If there is still too much liquid, turn up the heat to boil it off. Season and add the remaining tablespoon of olive oil. Mix gently so as to prevent the cauliflower from falling apart. Leave to cool slightly before serving, preferably warm rather than boiling hot. This entry was posted in Uncategorized, Vegetables & side dishes and tagged cauliflower by hungryenglishman. Bookmark the permalink. Wonderful!!!! A personal favourite of mine. an odd girlfriend of mine used to make it for me. A pure mixture of taste and nostalgia. Let me provde the backside line first.